After decades of decline, US oil production is increasing. Strong crude prices have provided the incentive to adapt drilling technology for conventional and unconventional (shale) oil that US producers first used for natural gas: horizontal drilling, proppants, pressure pumping (proppants + pumping = hydraulic fracturing), and polycrystalline-diamond compact (PDC) drill bits. North Dakota has been in the limelight for its rapidly increasing production. At 600,000 barrels per day (BPD), North Dakota just surpassed Alaska to become the second-largest oil producing state. Texas retains the top spot, at 1.1 million barrels per day (MMBPD). The Eagle Ford area of south Texas has gained prominence, but the long-lived, low-cost, prolific Texas workhorse is the 102,000-square-mile Permian Basin located mainly in west Texas, as well as in four New Mexico counties. According to Texas Railroad Commission statistics, in February 2012 the top nine oil-producing Texas counties were in the Permian basin. The tenth, Karnes, is in the Eagle Ford. Of February 2012 Texas oil production totaling 1,137,000 BPD, these nine Permian Basin counties (Andrews, Gaines, Yoakum, Ector, Midland, Upton, Martin, Hockley, Scurry) accounted for just under half, or 514,000 BPD. Not surprisingly, new Permian activity has helped boost overall Texas oil production between 2008 and 2011 by 16%. In the Permian, the long-time emphasis has been vertical Spraberry wells, but now the focus is horizontal Wolfcamp shale wells. 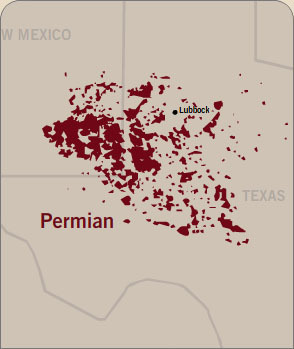 Initially developed by Henry Petroleum, some believe the Wolfcamp has the potential to be the largest resource play in the U.S, underlying thousands of square miles in West Texas with estimated reserves of 4.2 to 8.8 billion barrels of oil equivalent (BOE), mostly oil. Source rock thickness ranges up to a thousand feet. For reference, the Bakken is pegged by the USGS at 4.3 billion BOE, with estimates ranging from 12-20 billion BOE, again mostly oil. With oil prices six times those of natural gas on a BTU basis, new drilling switched from gas to oil during the last eighteen months. According to Oil and Gas Investor, applying the new technology in the West Texas Permian basin has increased liquids production from Permian wells as much as tenfold, and the Permian Basin rig count has doubled just since 2011 to 400 rigs. Further evidence of this potential is that five companies each budgeted Permian basin capital expenditures of over a billion dollars this year. What's good for the Permian is good for the state. Oil taxes and royalties are said to account for a quarter of Texas state government revenue. And lease sales include leases on University of Texas lands, a major mineral holder in parts of the Permian Basin. Although wells cost from $4 million to $8 million apiece, with the current technology there are no dry holes, and EURs (estimated ultimate recoveries) are 200,000 barrels to 600,000 barrels. So production pays back quickly. Water usage for fracturing remains an issue in dry West Texas. However, studies show that at current prices, far more revenue for the same amount of water is generated from oil drilling than from planting crops. Potential limits on Permian production growth include lower oil prices, market constraints, competition with Canadian and Bakken crude, limits on skilled labor and professionals, drilling equipment limits, insufficient takeaway capacity, increased Middle East production, regulatory uncertainty of the US presidential election, a decline in demand (the US is down to 250 million vehicles from 268 million), or any factor resulting in more oil supplied than demanded. What's good at $80/bbl doesn't look so smart at $65/barrel or less, says an oil company executive, and shale drilling becomes a breakeven proposition at $50/bbl. Indeed, according to one economist, we could see an increase in North American (US plus Canadian) production from 8 MMBPD to 12 MMBPD, with conventional production stable, but shale oil up to 2 MMBPD and heavy oil up from 2 MMBPD to 4.5 MMBPD. The Permian basin is not far from the major Gulf Coast refining market. Magellan Pipeline has 1.4-1.5 MMBPD of capacity and the region is estimated to require another 0.5-0.75 MMBPD of capacity. Since a large volume of natural gas and natural gas liquids (C2-C5) are inevitably co-produced with the oil, more fractionation plants are needed as well to strip out gas and light liquids before the oil can be sent to market.